Grab a seat and something wonderful to drink. Coffee is my choice, but you can go for whatever you choose (wink), and let's chit-chat, shall we? Let's pretend we're sitting at a nice little coffee place near my home. It's called Friends Café and they have big comfy couches and serve up a great tea latte or café americano. We'd order our warm drinks, pull our feet up on the sofa, and just talk. I would tell you that the week started off kind of blah because I had a sore throat on Monday and had to leave work. I'd tell you that I thought I was going to be sick in bed all week. It only lasted a day (thank you Lord!) and it turned out that I was just really tired because I slept pretty much all day. I went back to work on Tuesday and back to the grind. The rest of the week flew by, really. I would tell you that the hubby and I have been going to sleep close to midnight this whole week. We have a new addiction. See, we have signed up for Netflix and are now on the second season of The Walking Dead and it's only been three nights that we've been watching. It's a pretty good show considering it's zombies and stuff. Not one nightmare! And I haven't had one either - lol. I'd tell you that I'm thrilled with the Christmas present my brother got me - you know, the tablet I'm writing on right now! It's a Surface...and Lovey, I'm in heaven. I can take it anywhere with me and just write. Happiness at my fingertips! I would also tell you that I got the classes I needed for Spring semester. I'll be taking Speech and Biology...please oh please, I hope there is no dissection. If there is, please oh please, don't let me faint in front of a bunch of teenagers! These two last classes will fulfill the General Education requirements, Lovey! Then I can start taking the required courses to transfer for my major! What's my major? Oh, I finally decided! ((drum roll)) Psychology! I'm pretty thrilled. I would also tell you that tonight I sat down with my Lovebug (daughter, for you new Loveys) and we wrote a list of all the things we want to do together this year. Just the two of us. I'll probably share the list with you another time. How's your cup? Do you need a refill? I can warm up your mug. My treat. In a week or so, I'll be guest posting and doing a giveaway at a blog I'm sponsoring. I'm pretty excited about it and have already been shopping around for the little package of wonderfulness. It's hard for me to keep a secret, but you'll find out soon enough. I'll definitely let you know when to go to Cassie's blog...oops! See what I mean...can't even keep the girl's blog a secret. Jeesh! I'm happy to have spent time again with you this week. It warms my heart for you to spend your precious time with me. And for you new Loveys...Welcome! Thanks for another week, Loveys. Have a wonderful weekend and don't forget to just relax. 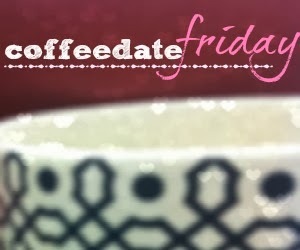 Linking up today with Alissa at Rags to Stitches for her #coffeedate. She serves the best coffee in Blogland. Join her every Friday and link up anything you'd like to talk about. There's no rules. Actually, there's only one, really. Be you. So happy you got the classes you need, and settled on a major! And really... you made it through math with no issues. You are going to rock biology! So, I just want it to be known that I helped you choose those classes with decisiveness and knew about everything listed above BEFORE you blogged them because I am your best friend... who happens to be ridiculously sick of being sick and perhaps a little cranky. I love besmirching your comment section. OH My Nay, you are so very tolerant of me. From the Subsol yo! Yay on getting the classes you need. I recall that less than fondly from college and may be facing that again soon! glad your feeling better and so happy that you got into the classes !! hehehe, had to smile at the netflix addiction, me and my husband were the same with Braking Bad, have you seen that? ?